Just need some electric bikes? No worries, we've got the best eBikes at the best rates, with all the extras included - helmet, lights, lock repair kit & instructions, carry rack & pannier bags. Pickup from Petone or Days Bay. Parts of the RCT can be tough - we swap the aptly-named Wild Coast Trail for an easier (but equally beautiful) coastal route, with less technically demanding riding. Three days of easy/moderate adventure cycling and two nights relaxing. 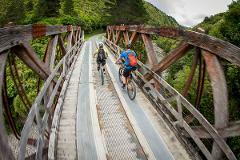 Enjoy a full day + two nights in Martinborough, bookended by riding the two best sections of the Remutaka Cycle Trail. 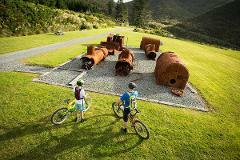 A fantastic way of making the most of a long weekend, and a great balance between riding and relaxing! Fully supported.